I remember vividly the first time I saw Victoria Falls in Africa. We’d travelled on our first safari specifically to see the Okavango Delta in Botswana, a unique wetland where animals roam across a shallow flood plain formed when the Okavango River drains into the Kalahari Desert, and Victoria Falls, one of the most famous natural spectacles in the world. I wasn’t sure how impressed we’d be with the Falls, though – after all, my hubby & I have lived just 15 minutes away from Niagara Falls since we were children, but I’ve always been fascinated by the story of David Livingstone, the official discoverer of Victoria Falls and the man who gave them their name. We entered the park that protects the Falls (points over the 3-ring circus that Niagara Falls has turned into), had our orientation talk, and followed the path towards the Devil’s Cataract, the first part of Victoria Falls that you encounter. Then the Falls came into view, and I stood there literally with my mouth hanging open. May is high-water season at the Falls, when 2 million litres of Zambezi River rushes over the precipice every second, with a thundering noise so loud we couldn’t hear ourselves speak. When the water reaches the bottom, over 300 ft below, it churns up spray rising over 1,000 ft into the air, obscuring the sun and falling back down as a heavy rain that turns the banks of the Zambezi from a dry savannah to a lush tropical jungle. The local people called it Mosi-oa-Tunya, “the smoke that thunders”, and we could see why. I took a movie clip with my newly acquired digital camera so that everyone back home could hear and see what it was like. Victoria Falls has been named one of the Seven Natural Wonders of the World, and there’s so much history attached to it as well, much of it tied closely to David Livingstone, one of the most famous explorers in history. He was born 200 years ago, in March 1813, and many areas in Africa associated with his journeys are celebrating the bicentennial with special events and safaris. Livingstone was a Scottish missionary who travelled to Africa to spread Christianity and became an instrumental figure in ending slavery. He explored a large part of the continent, braving serious injuries and illnesses on his mission. 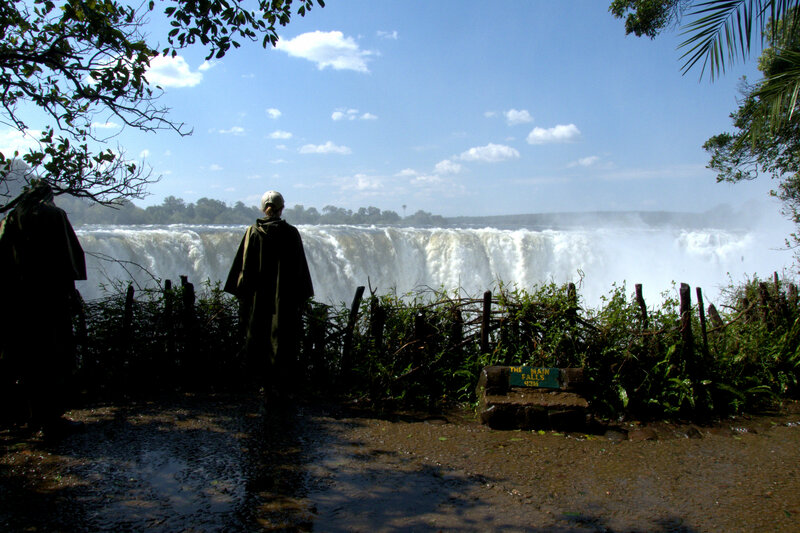 He was led to Victoria Falls by his native bearers in November 1855, and an island in the middle of the Zambezi River above the falls is named after him, as well as the town of Livingstone on the Zambian side of the falls. – the 15-day Footsteps of David Livingstone safari available through Sun Safaris, which visits Victoria Falls, Zambia and Lake Malawi. A flight over the Falls, which are so large (a mile wide) that it’s impossible to get a sense of the full extent of them from the ground. I’ve done a helicopter flight and really enjoyed it, but there are also flights on microlights (small very light 2-seater planes), although you can’t take your own camera on a microlight (there are wing cameras to record the flight for you). Walking across to the other side of the Falls — you can walk across the Victoria Falls Bridge, although you’ll need to purchase an entry Visa for the day at the border. There are more views of the Falls from the bridge, and the views of the Falls are quite different depending on whether you’re on the Zimbabwe side or the Zambia side. The most extensive views are in Zimbabwe, including Devil’s Cataract and the central curtain of water, but on the Zambian side you can get right up to the water’s edge (carefully), and there’s even a quieter section of water that you can wade in — local residents can often be found there cooling off on a hot day. You can bungee jump from the Victoria Falls Bridge at one of the most famous bungee locations in the world, but check current safety records first, as there was a non-fatal accident in January 2012 when a jumper’s heavy cable broke and the woman dropped into the water. Luckily it took place at low-water season — in May the rapids are so strong they can’t run white water rafting. You can also Zip-line and Abseil across the gorge. This is also one of the greatest places to do white-water rafting, but depending on the water levels the rapids below the Falls, as they churn through the narrow canyon carved over millions of years, can reach Category 6! If you’re travelling at high water season, don’t book and pay in advance — if the rafting isn’t running, you won’t be able to get your money back. A sunset cruise on the Zambezi is de rigeur — you can even do it on the African Queen, as we did (for all fans of the Bogart & Hepburn movie). You can see some wildlife on the cruise, but the real draw is the sunset, and it is magnificent. Walk with lions! One of our most incredible experiences in Africa has been to do a 1.5 hour bush walk with lions. The African Lion Encounter is a program that rescues lion cubs who wouldn’t be able to survive in the wild (orphaned, injured, lame), habituates them to people for several months, and then allow visitors to walk with them through a private game reserve. It’s a rare and very special opportunity to spend time with the juvenile lions, and even to be able to touch them. It was our first lion walk that changed my life and eventually led to the creation of Lion Tail Magic. All of these activities, and many others, can be booked through organizations like Safari Par Excellence, the company we used ourselves (http://safpar.com/activities.html). There are many places to stay in the Victoria Falls area. We stayed at Matetsi Water Lodge, a gorgeous, quiet and very romantic lodge on the Zimbabwe side about 40 miles outside of town (the lodge can provide transportation into town for activities), and we’ve also stayed on the Zambian side at the Zambezi Sun resort, which is located just steps from the Falls and inside the Mosi-oa-Tunya National Park. While it’s a busy resort popular with business groups who want a quick taste of Africa, you can watch the spray from the Falls create rainbows over the rooftops and enjoy the animals (no touching!!!) that wander freely through the resort grounds. The town of Livingstone in Zambia is a pretty town with a bit of a frontier feel to it, and one of the few places where you can buy memory cards if you run out! There’s also a fascinating museum dedicated to the life of David Livingstone and the history and culture of Zambia. The town is hosting a series of international events this year for the bicentennial. If you’d like to learn more about David Livingstone and his explorations, there are a couple of terrific websites, Livingstone Online and the National Museums Scotland Livingstone exhibit site. Watch our website for future articles about what it’s like on safari and how to prepare for one, or contact me directly at liontailmagic@gmail.com. I’ll be happy to give you any feedback that I can about travel to my favourite place in the world, the magnificent continent of Africa. Happy exploring, virtual or otherwise!